Mary Cochrane enlisted in the Marine Corps in 1944 to “free a man to fight” in World War II by serving as a truck driver. 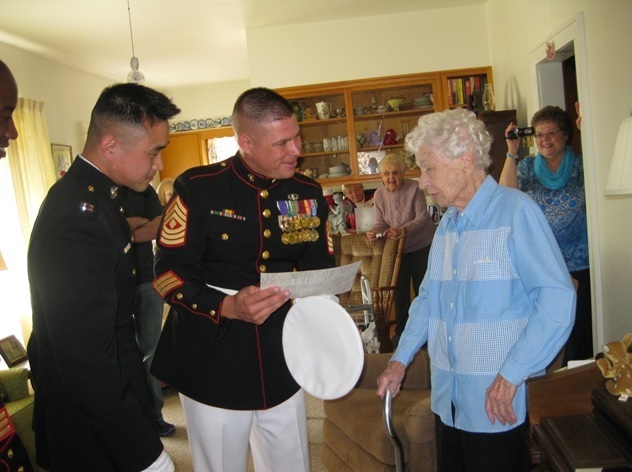 On April 18 she celebrated her 100th birthday–made sweeter with a cake brought to her home by a detachment of reserve Marines, and a letter of congratulation from Marine commandant Gen. Jim Amos. The Marines, an inspector-instructor detachment from Peru, Indiana, spent time discussing Marine Corps memories with Cochrane and reviewing photos from her time as a young Marine. 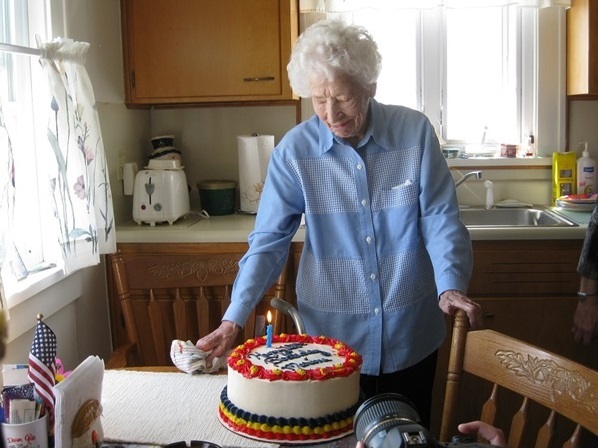 The Marines from Lima were not the only ones to celebrate Cochrane on her big birthday. An email exchange between Amos, Marine Corps Sgt. Maj. Mike Barrett, and staff director for Headquarters Marine Corps Maj. Gen. Michael Regner reviewed by Marine Corps Times shows that the Corps’ senior leaders took time to honor Cochrane’s service. 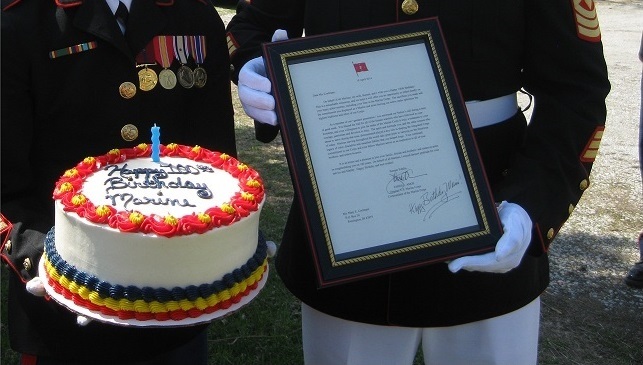 Watch the video the Marines produced of Cochrane’s birthday presentation below. Happy Birthday Mary. Semper Fi and may you have many more. Happy Birthday Mary. God Bless, Semper Fi Marine. Happy Birthday Mary, and may you have a joyous and blessed birthday! Semper Fi Marine!! Happy Birthday Marine. Fabulous to see you on your birthday video. You are an inspiration. God bless you and Semper Fi. HAPPY BIRTHDAY MARY, I am the Sr. Vice Commandant of Detachment 1151 marine corps league Bangor Maine and we also have a 90 years young LADY MARINE IN OUR DETACHMENT, SHE IS SO PROUD AS WE KNOW YOU ARE.SEMPER FIDELIS MARY!!! Happy birthday Mary and Thank You, hugs!! Way to go May, Looking Good + Semper Fi Marine…! No doubt ” Chesty ” is Proud of you….as we all are…!!!! A salute and a Happy belated birthday with the utmost respect, adoration and celebration of and for you!!!! Happy Birthday from one Woman Marine to Another! 1973-1977.